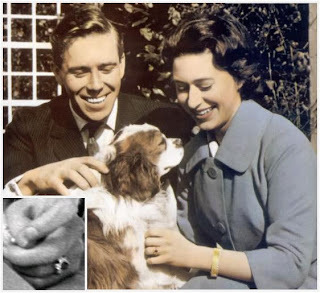 We began our mini-series on royal engagement rings with some of the best-known examples, worn by some of most famous Windsor ladies. Today we pick up with more British family members, including some less famous rings. 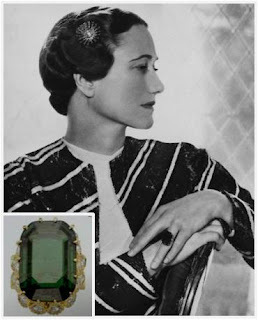 When she finally married her controversial love, the abdicated King Edward VIII, Wallis Simpson wore an enormous Colombian emerald, just under 20 carats, set in a ring from Cartier which was inscribed "We are ours now 27.X.36" (WE being their initials, plus the date they chose for their engagement - which was the day her divorce was granted). It was originally set in a simple platinum setting, but she had it reset in a more fashionable diamond leaf setting later on. 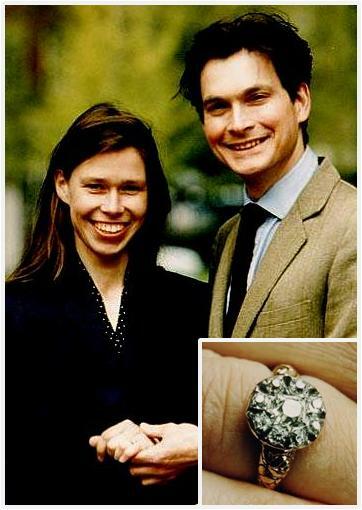 The ring was auctioned with the rest of her jewelry collection after her death. 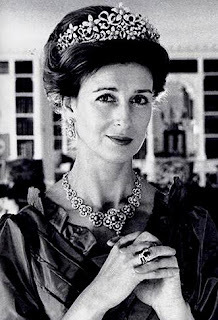 Antony Armstrong-Jones made a thoughtful choice for his fiancée, selecting a ring described as "a ruby set like a rosebud with a diamond marguerite", for Princess Margaret Rose. 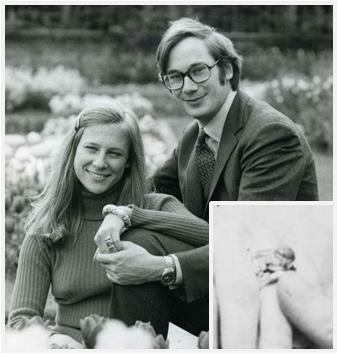 Princess Margaret's son, David, gave Serena Stanhope a diamond ring on a delicate gold band and a gold wedding band, both from Wartski. Princess Margaret's daughter received an old style cluster ring from Daniel Chatto, a fitting choice for an artist. 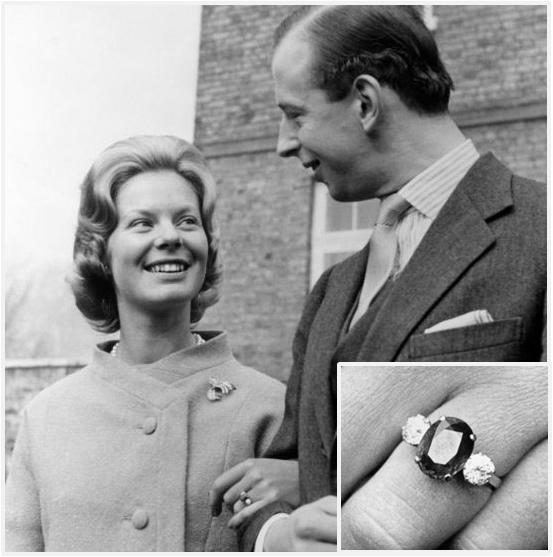 Returning to the family trend of sapphire engagement rings, Prince Henry presented Lady Alice Montagu Douglas Scott with a simple square sapphire ring. One of the more unique rings we'll see is the one Prince Richard, studying to be an architect, designed for Birgitte van Deurs - a wide and intricate silver ring set with coral. 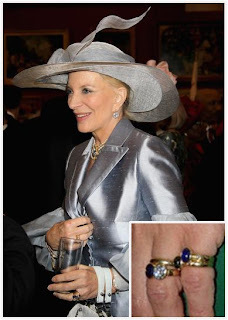 I don't notice the Duchess wearing it these days, though her appearances are so low key it would be easy to miss the details. 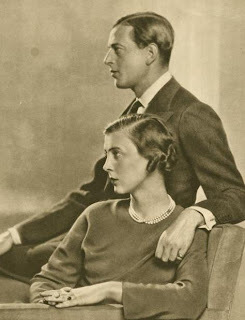 Princess Marina's engagement ring is described by Leslie Field as a "square 7 carat Kashmir sapphire with a baguette diamond on either side set in platinum". Marina's ring set a sapphire trend in the Kent family - the present Duchess has an oval sapphire with a round diamond on either side. Marina's daughter Alexandra also has an oval sapphire flanked by a diamond on either side, set in platinum. And one final sapphire ring for Princess Michael - a round sapphire and diamond, stones Prince Michael is said to have inherited from his mother Princess Marina, who died a decade before their marriage. 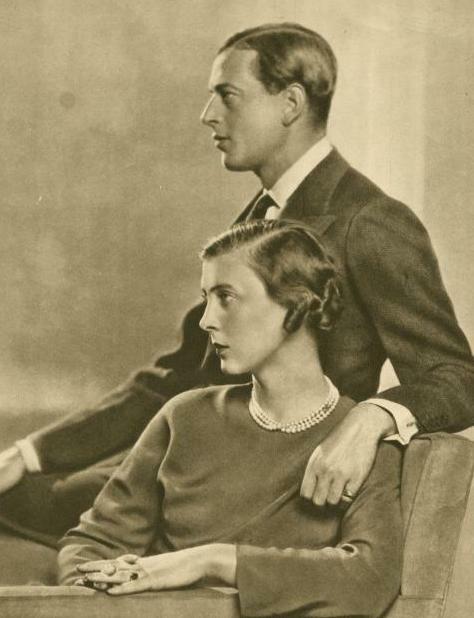 And that's it for the Windsors! 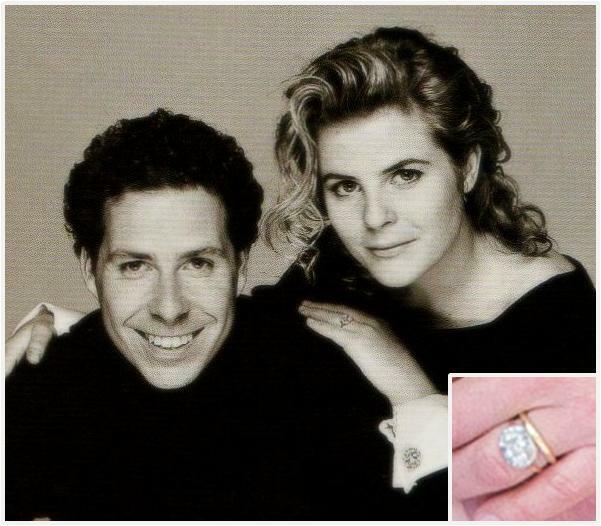 As I said, this is not entirely comprehensive - feel free to add additional rings in the comments. 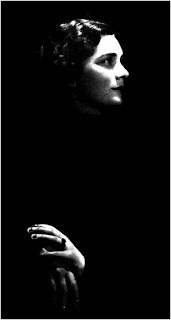 Next time: we leave British shores.